passenger jet airliner developed by Boeing in the early 1950s. Its name is most commonly spoken as "Seven Oh Seven". Boeing delivered a total of 1,010 Boeing 707s, which dominated passenger air transport in the 1960s and remained common through the 1970s. As of October 2006, 68 Boeing 707 aircraft (of any variant) were reported to be remaining in airline service, with just two airlines flying passengers, Saha Airlines of Iran and LADE Airlines of Argentina. Boeing also offered a smaller, faster version of the aircraft that was marketed as the Boeing 720. Although it was not the first commercial jet in service (that distinction belongs to the De Havilland Comet), the 707 was the first to be commercially successful, and is credited as ushering in the Jet Age. It established Boeing as one of the largest makers of passenger aircraft, and led to the later series of aircraft with "7x7" designations. The 707 was based on an aircraft known as the 367-80. The "Dash 80", as it was called within Boeing, took less than two years from project launch in 1952 to rollout on 14 May 1954. This was powered by the Pratt & Whitney JT3C engine which was the civilian version of the J57 used on many military aircraft of the day including the F-100, F-101, F-102, and the B-52. 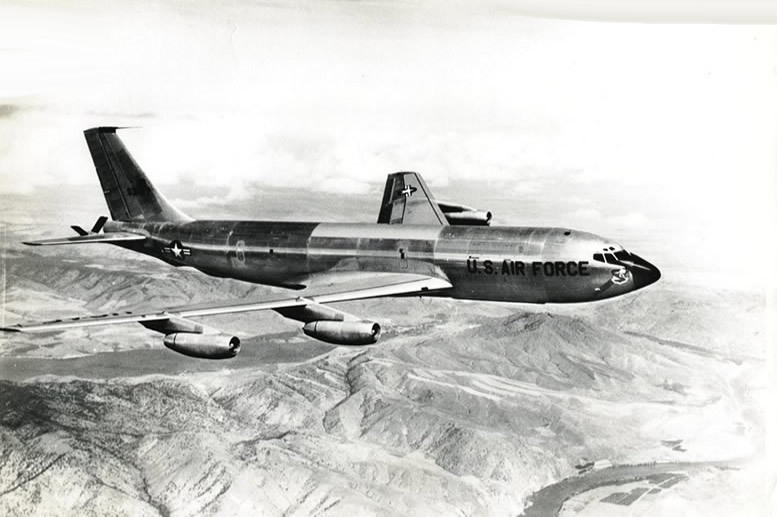 The prototype was conceived for both military and civilian use: the United States Air Force was the first customer for the design, using in the KC-135 Stratotanker midair refueling platform. It was far from certain that the passenger 707 would be profitable. At the time, Boeing was making nearly all of its money from military contracts: its last passenger transport, the Boeing 377 Stratocruiser, had netted the company a $15 million loss before it was purchased by the Air Force as the KC-97 Stratotanker. The 132 inch fuselage of the Dash 80 was only wide enough to fit two-plus-two seating (in the manner of the Stratocruiser). Boeing soon realized that this would not provide a viable payload, so decided to widen the fuselage to 144 inches, the same as the KC-135 Stratotanker, which would allow six-abreast seating - and the shared use of the KC-135's tooling. However, Douglas had launched its DC-8 with a fuselage width of 147 inches. The airlines liked the extra space, and so Boeing was obliged to increase the 707's cabin width again, this time to 148 inches. This meant that little of the tooling that was made for the Dash 80 was usable for the 707. The extra cost meant the 707 did not become profitable until some years after it would have if these modifications were not necessary. The first flight of the first production 707-120 took place on 20 December 1957, and FAA certification followed on 18 September 1958. Boeing would later develop a smaller, faster version of the aircraft that was marketed as the Boeing 720. Between 1959 and 1967, there were 154 models built, hoping to fill the short to medium range commercial market. Other competing aircraft was also in this market with the Convair 880 and 990 aircraft. Pan Am was the first airline to operate the 707; the aircraft's first commercial flight was from New York to Paris on 26 October 1958. American Airlines operated the first domestic 707 flight on 25 January 1959. 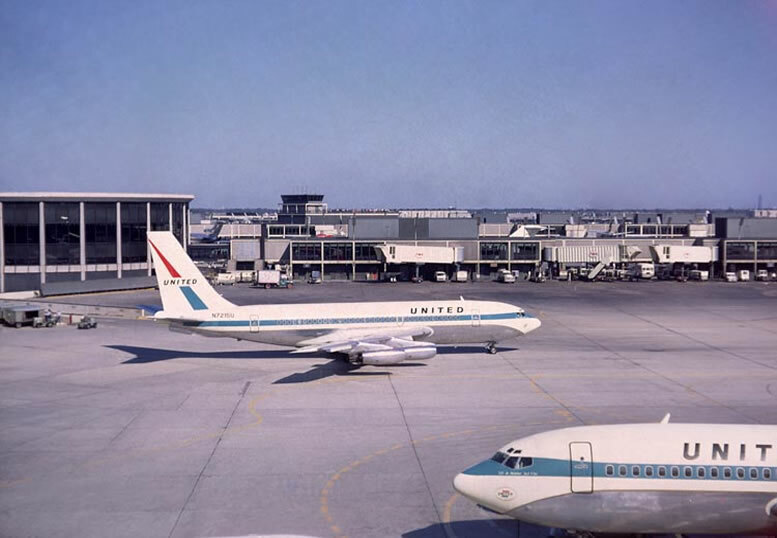 Airlines which had only ordered the DC-8, such as United, Delta and Eastern, were left jetless for months and lost market share on transcontinental flights. The 707 quickly became the most popular jetliner of its time. Its popularity led to rapid developments in airport terminals, runways, airline catering, baggage handling, reservations systems and other air transport infrastructure. The advent of the 707 also led to the upgrading of air traffic control systems to prevent interference with military jet operations. In order to become a new major player in the commercial airliner business, Boeing was quick to bend to customer's desires. 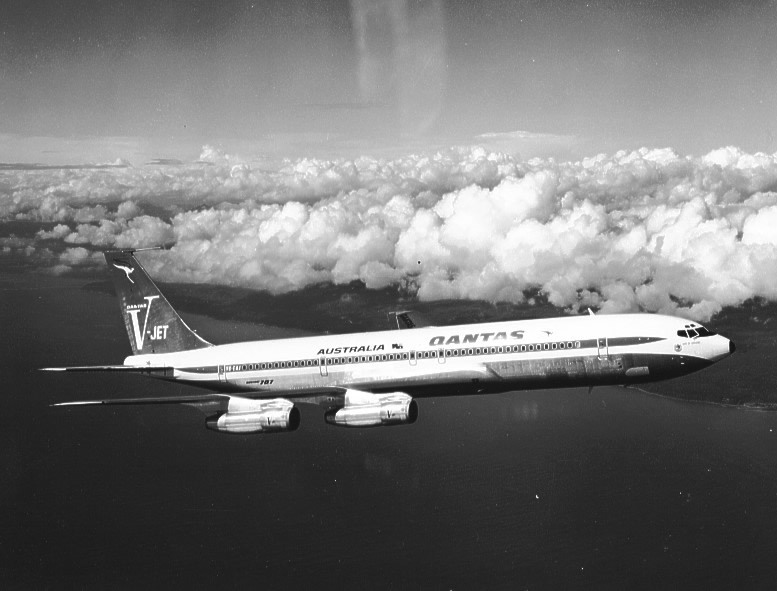 While the 707-120 was the initial standard model with Pratt & Whitney JT3C engines, Qantas ordered a shorter body version called the 707-138 and Braniff ordered the higher-thrust version with Pratt & Whitney JT4A engines, the 707-220. The final major derivative was the 707-320 which featured an extended-span wing and JT4A engines, while the 707-420 was the same as the -320 but with Rolls-Royce Conway turbofan engines, making the aircraft more acceptable for the British market. British certification requirements relating to engine-out go-arounds also forced Boeing to increase the height of the tail fin on all 707 variants, as well as adding a ventral fin. Eventually, the dominant engine for the Boeing 707 family was the Pratt & Whitney JT3D, a turbofan variant of the JT3C with even lower fuel consumption, as well as higher thrust. JT3D-engined 707s and 720s were denoted with a "B" suffix - while many 707-120Bs and 720Bs were conversions of existing JT3C-powered machines, 707-320Bs were only available as new-built aircraft as they had a stronger structure to support a maximum take-off weight increased by 19,000 lb, along with minor modifications to the wing. The ultimate 707 variant was the 707-320C, (C for "Convertible") which was fitted with a large fuselage door for cargo applications. This aircraft also had a significantly revised wing featuring three-section leading-edge flaps. This provided an additional improvement to takeoff and landing performance, as well as allowing the ventral fin to be removed (although the taller fin was retained). 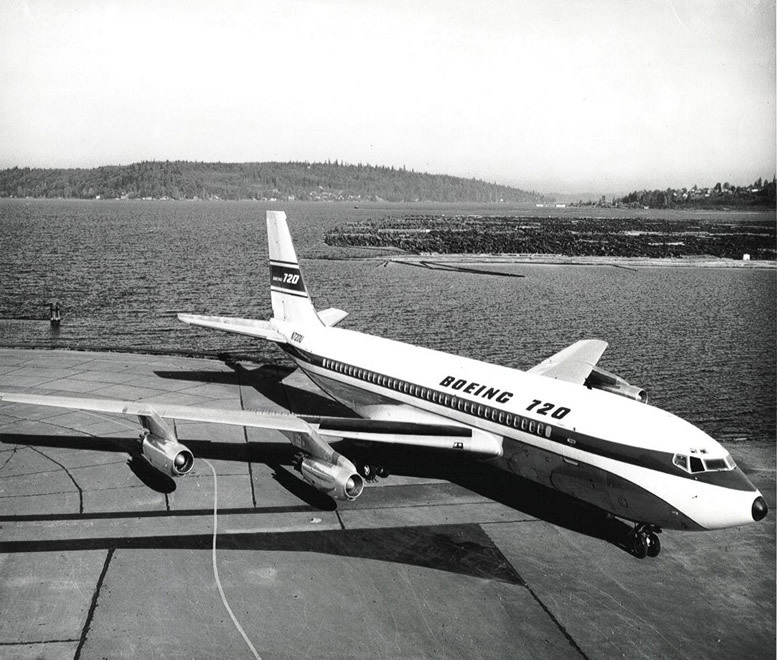 707-320Bs built after 1963 used the same wing as the -320C, and were known as 707-320B Advanced aircraft. As the 1960s drew to a close, the exponential growth in air travel led to the 707 being a victim of its own success. The 707 was now too small to handle the increased passenger densities on the routes for which it was designed. Stretching the fuselage was not a viable option because the installation of larger, more powerful engines would in turn need a larger undercarriage, which was not feasible given the design's limited ground clearance. Boeing's answer to the problem was the first twin aisle airliner - the Boeing 747. The 707's first-generation engine technology was also rapidly becoming obsolete in the areas of noise and fuel economy. Production of the passenger 707 ended in 1978. In total, 1,010 707s were built for civil use, though many of these found their way to military service. 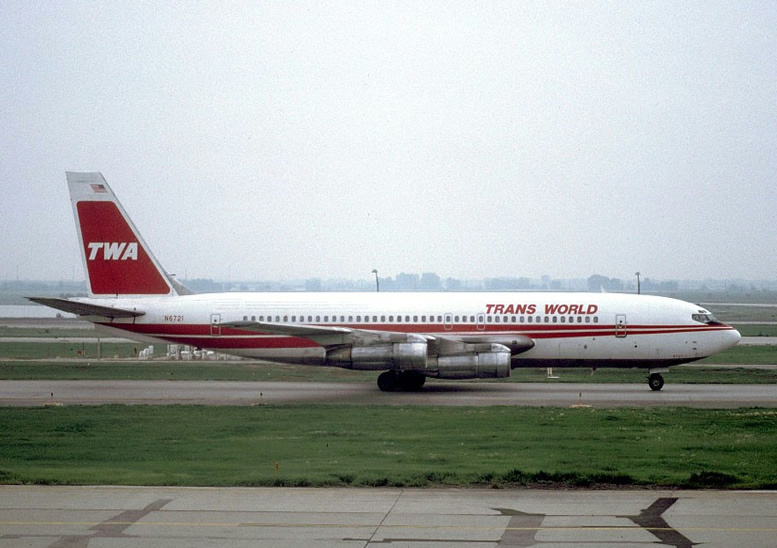 Trans World Airlines flew the last scheduled 707 flight for passengers by a US carrier on 30 October 1983, although 707s remained in scheduled service by airlines from other nations for much longer. Middle East Airlines (MEA) of Lebanon flew 707s and 720s in front-line passenger service until the end of the 90s, and now only Saha Airlines of Iran and LADE of Argentina fly 707s in passenger service. Saha's domestic flights from Tehran to Mashhad, Kish Island and Shiraz are not listed in the July, 2007 OFFICIAL AIRLINE GUIDE, however, if still operating. However, LADE flights from El Palomar Air Force Base near Buenos Aires to Rio Gallegos and Comodoro Rivadavia are so listed. The purpose-built military variants remained in production until 1991. Traces of the 707 are still found in the 737, which uses a modified version of the 707's fuselage, as well as essentially the same external nose and cockpit configuration as the 707. These were also used on the previous Boeing 727, while the Boeing 757 also used the 707 fuselage cross-section. The Chinese government sponsored development of the Shanghai Y-10 during the 1970s, which was a near carbon-copy of the 707, however this did not enter production. The 707's engines could not supply sufficient bleed air for pressurization without a serious loss of thrust, so the aircraft instead used engine-driven turbocompressors to supply high-pressure air for this purpose. On many commercial 707s the outer port (#1) engine mount is distinctly different from the other three, as this is the only engine not fitted with a turbocompressor. The Boeing 707 was the first commercially successful airliner to use podded engines. On one customer acceptance flight, where the yaw damper was turned off to familiarize the new pilots with flying techniques, a trainee pilot exacerbated the Dutch Roll motion causing a violent roll motion which tore two of the four engines off the wing. The plane, a brand new 707-227 N7071 destined for Braniff, crash landed on a river bed north of Seattle at Arlington, Washington, killing four of the eight occupants. In his autobiography, test pilot Tex Johnston described a Dutch Roll incident he experienced as a passenger on an early commercial 707 flight. As the aircraft's movements gradually became more severe, he went to the cockpit and found the crew frantically attempting to resolve the situation. He introduced himself and relieved the ashen-faced captain who immediately left the cockpit feeling ill. Johnston quickly stabilized the plane and later, even landed it for the crew. Pratt & Whitney, in a joint venture with Seven Q Seven (SQS) and Omega Air, has developed the JT8D-219 as a re-engine powerplant for Boeing 707-based aircraft, calling their modified configuration a 707RE. Northrop Grumman has selected the -219 to re-engine the United States Air Force’s fleet of 19 Joint Surveillance Target Attack Radar System (E-8 Joint STARS) aircraft, which will allow the JSTARS more time on station due to the engine's greater fuel efficiency. NATO also plans to re-engine their fleet of E-3 Sentry AWACS aircraft. The -219 is publicized as being half the cost of the competing 707 re-engine powerplant, the CFM-56, and is 40dB quieter than than JT3D engines that are being replaced. British Caledonian Boeing 707 shown at Prestwick International Airport, South Ayrshire, Scotland, 1972.367-80 (Dash-80): The original prototype jet transport layout. Used to develop the 707, it was fitted with four Pratt & Whitney JT3C engines producing 10,000 lbf (44 kN) each. First flight was 15 July 1954. 707-120: 69 of the first production 707s were built, with a longer fuselage and greater wingspan than the original Dash-80. A full set of rectangular cabin windows was included for the interior, which was capable of a seating 179 passengers. The version was designed for transcontinental routes and often required a refuelling stop when used on the North Atlantic route. It was fitted with four Pratt and Whitney JT3C-6 turbojets, civilian versions of the military J57 model, which produced 12,500 lbf each, allowing a 257,000 lb TOGW. First flight was on 20 December 1954. Other major orders were the launch order for 20 707-121 aircraft by Pan American and an American Airlines order for 30 707-123 aircraft. Pan Am service began the 707 career on 26 October 1958. 707-138: Qantas has been assigned the Boeing customer number of 38. The 13 -138 were based on the -120 but had a 10 foot reduction to the rear fuselage and was capable of increased range. 707-220: Designed for hot and high operations with powerful Pratt & Whitney JT4A-3 turbojets, only five of these were ultimately produced. 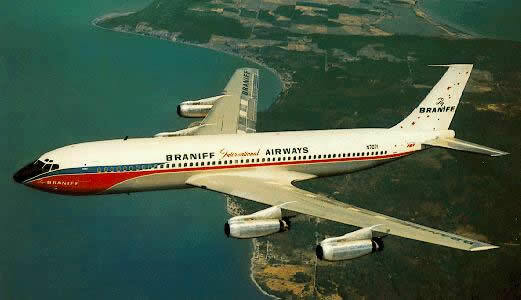 All were for Braniff International Airways and carried the model number 707-227. This version was made obsolete by the arrival of the turbofan powered 707-120B. 707-320 Intercontinental: A stretched version of the turbojet-powered original model, powered by JT4A-3 turbojets producing 15,800 lbst each. The interior allowed for up to 189 passengers due to a 100 inch stretch, while a longer wing carried more fuel increasing range by 1,600 miles allowing the aircraft to operate as true transoceanic aircraft. Take-off weight was increased to 316,000 lb. First flight was on 11 January 1958 and 69 turbojet -320s were produced. 707-120B: The first major upgrade to the design was a re-engining with JT3D-3 turbofans, which were quieter, more powerful, and more fuel efficient, producing 18,000 lbf each. The aircraft also received extra leading edge slats and the tailplane was enlarged. A totla of 72 of these were built, and many more were converted from 707-120 aircraft, including Qantas' aircraft, which became 707-138B aircraft upon conversion. The first flight of the -120B was on 22 June 1960. 707-320B: A re-engining of the stretched version was undertaken in parallel with the -120B, using the same JT3D-3 turbofans and incorporating many of the same airframe upgrades as well. Take off gross weight was increased to 335,000 lb. 175 of the 707-300B aircraft were produced, as well as upgrades from original -320 models. One of the final orders was by the Iranian Government for 14 707-3J9C aircraft capable of VIP transportation, communication, and inflight refuelling tasks. 707-320B Advanced: A minor improvement made available to -320B aircraft, adding three-section leading edge flaps. These reduced takeoff and landing speeds, and also altered the lift distribution of the wing allowing the ventral fin found on earlier 707s to be removed. The same wing was also used on the -320C. 707-320C: A convertible passenger/freight configuration which ultimately became the most widely produced variant of the 707, the -320C added a strengthened floor and a new cargo door to the -320B model. 335 of these variants were built, including a small number with uprated JT3D-7 engines and a takeoff gross weight of 336,000 lb. Despite the convertible option, a number of these were delivered as pure freighters. 707-420: A version of the 707-320 originally produced at specific request for BOAC and powered by Rolls-Royce Conway 508 turbofans, producing 17,500 lbf each. Although BOAC initiated the programme, Lufthansa was the launch customer and Air India was the first to receive a 707-420 on February 18 1960. A total of 37 were built to this configuration. 707-700: A test aircraft used to study the feasibility of using CFM International's CFM56 powerplants on a 707 airframe and possibly retrofitting them to existing aircraft. 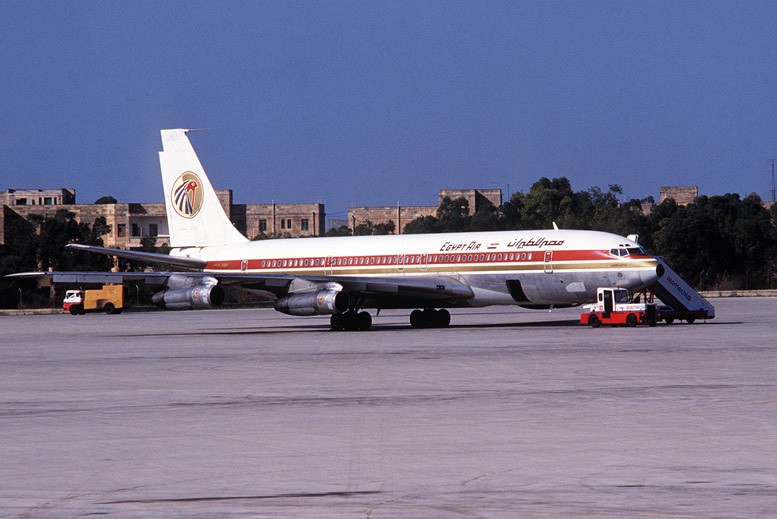 After a testing in 1979 N707QT, the last commercial 707 airframe, was refitted to 707-320C configuration and delivered to the Moroccan Air Force as a tanker aircraft. (This purchase was considered a "civilian" order and not a military one.) Boeing abandoned the program, since they felt it would be a threat to the Boeing 757 program. The information gathered in the test led to the eventual retrofitting program of CFM56 engines to the USAF C-135/KC-135R models, and some military versions of the 707 also used the CFM56. Ironically the Douglas DC-8 "Super 70" series by Cammacorp did develop commercially, extending the life of DC-8 airframes in a stricter noise regulatory environment so there are today more DC-8s in commercial service than 707s. 720: Originally designated 707-020 but later changed for marketing reasons, was a modification of the 707-120 designed for medium-range operation from shorter runways. It was lighter and faster than the Boeing 707, and had a simplified wing design. This model had few sales, but was still profitable due to the minimal R&D costs associated with modifying an existing type. At one point in the promotion stage to airlines it was known as the 717, although this model designation remained unused until it was applied to the MD-95 following Boeing's merger with McDonnell Douglas. The 720 was used before the Boeing 727 replaced it in the market. First flight was on 23 November 1959 and 64 of the original version were built. 720B: The turbofan-powered version of the 720, with JT3D-1-MC6 turbofans producing 17,000 lbf each. Takeoff gross weight was increased to 235,000 lb. 88 of these were built in addition to conversions of existing 720 models. 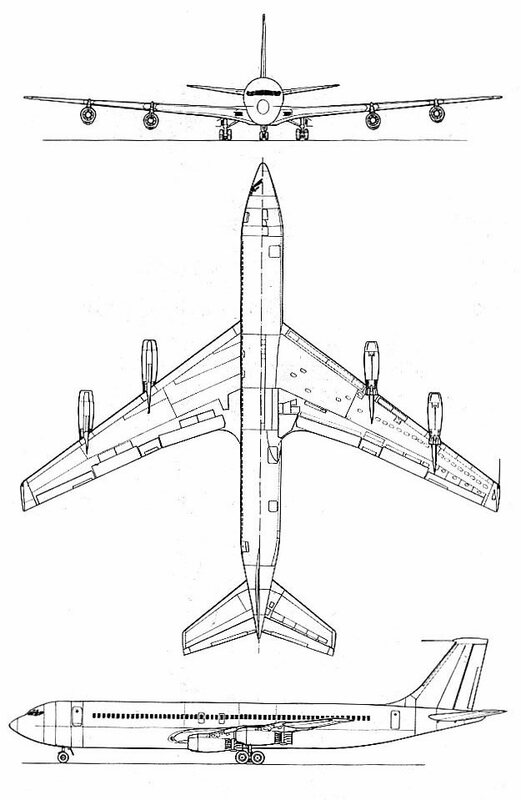 C-18: The US military designation for the 707-320C. C-18A:Eight second-hand (former American Airlines) 707-323Cs bought as crew trainers for the EC-18Bs, four later converted to EC-18B, two converted to EC-18D, one to C-18B and one was not taken into service and used for spares. C-18B: One C-18A modified with instrumentation and equipment to support the Military Strategic and Tactical Relay System (MILSTAR). EC-18B: Four C-18As modified alongside the C-135 for Advanced Range Instrumentation Aircraft ARIA missions in support of the Apollo space program. EC-18C:Original designation for two prototype J-STAR aircraft, later redesignated E-8A. EC-18D: Two C-18As modified as a Cruise Missile Mission Control Aircraft (CMMCA). TC-18E: Two second-hand (former Trans World Airlines) 707-331 aircraft modified for E-3 pilot and crew training. TC-18F: Two second-hand (former TAP) 707-382 aircraft modified for E-6 pilot training. C-137 Stratoliner: The USAF purchased a number of 707s under the C-137 series. VC-137A:Three 707-153s with a 22-passenger VIP interior and provision for use as an airborne command post, re-designated VC-137B. VC-137B:The three VC-137As re-engined with four JT3D-3 engines, operated by the 89th Military Airlift Wing, redesignated C-137B. C-137B: The three VC-137Bs redesignated when downgraded from VIP role. VC-137C: Two 707-353Bs were purchased by the USAF (one in 1961 and one in 1972) for service as a presidential transport with call signs SAM 26000 and SAM 27000, redesignated C-137C. C-137C: The two VC-137Cs, 20043 and 20297 were redesignated when downgraded from presidential use. Two further C-137Cs were acquired by the USAF, one 707-396C a seized former arms smuggler acquired in 1985 and one 707-382B bought second hand in 1987. EC-137D: Two aircraft built as Early Warning and Control System prototypes, later re-engined and re-designated E-3A. A further second-hand 707-355C aircraft was acquired and configured as an airborne special operations command post. CC-137 Husky: Canadian Forces designation for the 707-347C. KC-137: Aerial refueling tankers purchased by the Brazilian Air Force. E-3 Sentry: Airborne warning and control system (AWACS) aircraft that provides all-weather surveillance, command, control and communications, to the United States, NATO and other air defense forces. Based on the 707-320B, production ended in 1992 after 68 had been built. Boeing Sentry AEW1: The Royal Air Force designation for seven E-3D AWACS aircraft. KE-3A: The Royal Saudi Air Force purchased eight E-3 aircraft configured as aerial refueling tankers. E-8 Joint STARS: The E-8C Joint Surveillance Target Attack Radar System (Joint STARS) is a USAF airborne battle management and command and control (C2) platform that conducts ground surveillance to develop an under standing of the enemy situation and to support attack operations and targeting that contributes to the delay, disruption and destruction of enemy forces. 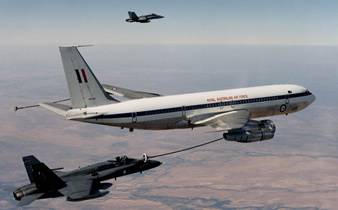 707T/T: The 707 Tanker/Transport. Italy purchased and converted four 707s, three to tankers and one to a straight freighter. Only two 707 tankers remain operational as of 2007. Also, Omega Air operates K707 tankers for lease. Condor: Airborne Early Warning, Command and Control (AEWC&C) aircraft developed in conjunction with Israel Aircraft Industries (IAI) using a former Lan Chile aircraft. Although 707s are no longer employed by major airlines 63 aircraft remain in commercial use, mainly with air cargo operators. 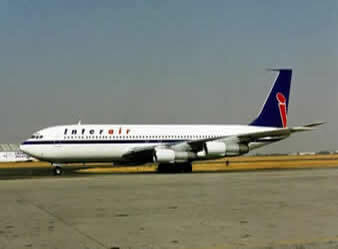 As of August 2007 commercial operators of the Boeing 707 with more than one aircraft include: African Airlines International (4), Air Charter Express (2), Angola Air Charter (3), Azza Transport (2), Beta Cargo (4), Hewa Bora Airways (3), Interair (2), Iran Air (4), Iraqi Airways (2), Libyan Arab Airlines (4), Saha Airlines (4), Sky Aviation FZE (2), Skymaster Airlines (5), Sudan Airways (2), Sudanese States Aviation (2) and TMA (5). American actor John Travolta owns, and is qualified to fly as second in command, an ex-Qantas 707-138B, registration N707JT. The list of customer codes used by Boeing to identify specific options and trim specified by customers was started with the 707, and has been maintained through all Boeing's models. Essentially the same system as used on the earlier Boeing 377, the code consisted of two digits affixed to the model number to identify the specific aircraft version. For example, Pan American Airlines was assigned code "21." 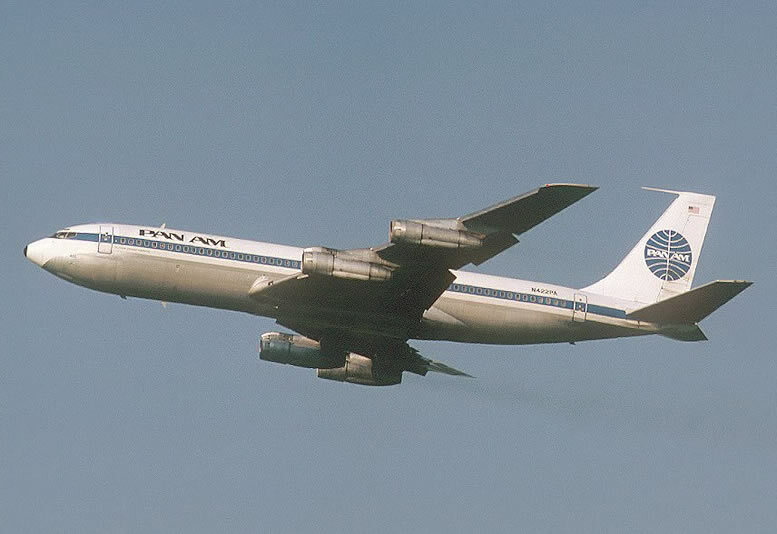 Thus a 707-300B sold to Pan Am had the model number 707-321B. The number remained constant as further aircraft were purchased, thus when Pan American purchased the 747-100 it had the model number 747-121. N70700 Model 367-80 (Prototype) previously at the Museum of Flight, Seattle, WA; now at Steven F. Udvar-Hazy Center, Washington, DC. 58-6970 Model 707-153 USAF VC-137B "SAM 970", Museum of Flight, Seattle, WA. 58-6971 Model 707-153 USAF VC-137B Pima Air and Space Museum, Tucson, AZ. N751TW Model 707-720, in storage, Pima Air & Space Museum, Tucson, AZ. VH-XBA Model 707-138B (No. 29) one of the first 707s exported (sold to Australian airline Qantas in 1959) is on display at the Qantas Founders Outback Museum in Longreach, Queensland, Australia. F-BLCD Model 707-328B (No. 471) is on display at the Musee de l'Air, Paris, France. 62-7000 Model 707-353B (VC-137C) Air Force One is on display at the Ronald Reagan Presidential Library in Simi Valley, California. The 707 is mentioned in the songs "Jet Airliner" performed by The Steve Miller Band and written by Paul Pena; "Early Morning Rain" by Gordon Lightfoot; and "Leaving on a jetplane" performed by Peter Paul and Mary and written by John Denver. The aircraft also has a major role in the Airport and Airplane films.